You’ve just discovered an ever expanding archive of guitar and bass effects pedals both old and new. The Pedal Finder database contains a wide variety of effects pedals attached to meaningful meta-data that allows you to search for new pedals in ways you never could before now. Go beyond simple keywords and instead search for pedals based on the type of music you play, the guitar or amplifier you use and even by the way a specific pedal looks. Pedal Finder is a website that rewards you for your contributions and connects you to valuable information and reviews, helping you discover new sounds to add to your pedal board. All in all, it’s a place for musicians, by musicians. For most of us, finding new pedals and new tones means searching the net, reading reviews and gathering information to comparison shop. If all goes well, you’ll eventually plug in a new pedal to take for a spin. There are many places on the web to gather scattered information, but no place that combines comprehensive search features along with pedal reviews from actual users. That’s where Pedal Finder comes in, with three distinct ways to find new pedals depending on your needs. The straightforward ‘Search by Keywords’ method is primarily how musicians have found new effects pedals since the dawn of the web browser. If you’re looking for a distortion pedal, just input ‘distortion’ into the search bar and you’ll get a list of distortion pedals to view. From the results, you can narrow your search down by digging through reviews and getting a feel for how each pedal sounds under certain circumstances. This feature is best for looking up pedals and manufacturers you already know about, but want more information on. However, if you really want to find a pedal suited to your specific needs, you want to try out the ‘Search by Style’ feature. The ‘Search by Style’ feature allows you to find pedals based on what you play and how you play. Instead of just diving into a sea of distortion pedals, explore what others use based on specific search parameters. This will give you results that are more relevant to your needs. Find out which pedals soar with tube amps and discover the ones that perform best with solid state. Find out what distortion crushes leads and which ones work well for rhythm. Just click the radial buttons on the choices above and hit ‘Find Pedals’ and your off. Here are some of the choices, you’ll get to make. Instrument: Pretty simple to understand – pick the instrument you play. Pickup: If you picked guitar or bass, then you probably have pickups. The type of pickups you have effect the sound you have and that includes the sounds that come out of any effects pedal. Not all combinations of pickups and pedals will give the same sound, so find out what others are doing and what sounds they are getting. If you don’t have pickups, just leave this blank. Amp: The type of amp you use is important to the sound you’ll have. Here you can choose between tube or solid state. You can also pick direct input, mixer or other for those studio musicians out there. Pedal Categories: Here you can pick what type of pedal you are looking for; distortion, delay, etc. If you just want to find out what people are using generally for a specific instrument or genre, then leave this blank and it will default to all. Genre: The most dreaded question you can ask a musician is, “What type of music do you play?” Nobody wants to relegate their creativity to a category, but sometimes it’s just easier to define what we like in general. 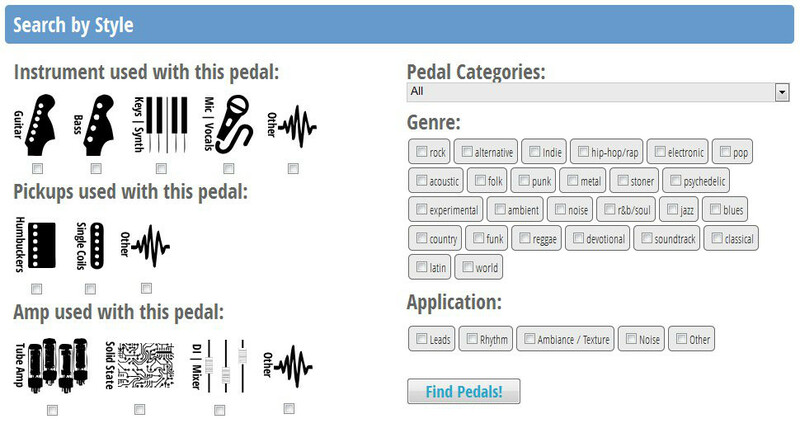 At Pedal Finder we ask you to pick a genre to get an idea of the style of music your playing. This will allow you to find others who play the same type of music and the pedals they use as well. Also, feel free to pick more than one genre. Does that make you feel better? Application: Are you looking for something to play leads or rhythm? Just looking to make noise or add texture? You can let us know here. The key to the ‘Search by Style’ feature working well is having a large amount of user reviews. Without reviews, the results of the search won’t be very impressive. So if you are jumping on this site in the early days of pedal finder, be aware that we are still growing and that the results you receive may be limited. If you want to help, leave a review of the pedals you own. Find out more about how we’ll enter your name into a prize drawing for each review you leave in future posts. Also known as an aesthetic search, the ‘Search by Look’ feature allows you to find a pedal based on how it looks. This search feature comes in especially handy when you can’t identify what is on your favorite musicians board. If all you know is that it was red, in a single enclosure with two knobs and one switch, plug in the settings and you’ll narrow it down to a manageable amount of pedals. From there you can pour over the results and with luck discover another tone that you can’t do without.